Now these are all very smart people who have a clear sense of their assets. (They rarely have liabilities.) But having worked for some time and with great focus on their goal, they frequently have crossed the finish line without noticing. I then have the distinct honor and privilege of being the one who gets to point it out. Great fun, that. And smiles all around. So too with today’s Case Study. John reached out in the Ask jlcollinsnh section a little while back and, in laying out his situation and questions, I was reminded of several of those one-on-one sessions. Here too was a guy who has worked hard, lived frugally and built his assets; and now I get to tell him he has arrived. Whoo Hoo! This despite an unfortunate and fairly large at-risk investment with a relative. Certainly investing well is important, and that’s mostly what I talk about here on the blog. But you can make a lot of investing mistakes and, if your savings rate is robust enough, you’ll still get there. The truth is, I got there myself along a great trail of investing blunders and before ever investing in my first index fund. That’s what a powerful savings rate will do for you. Of course, if I’d accepted the simplicity and power of indexing sooner, I would have gotten there far more quickly and with far less grief along the way. But then, I’m a slow learner. But now let’s meet John, see where he is at the moment and see what adjustments he might make for the future. I’ve really enjoyed reading your website, blogs, etc., your outlook on investments, business, life, etc., make a lot of sense to me. If you could give me your input I would be so grateful. I know that all decisions are mine and I am responsible solely for their outcomes. I am in midlife change. I am 56, single, no children, owned a small business for many years so I wanted to stay as liquid as possible. I rent a 1 bedroom apt. 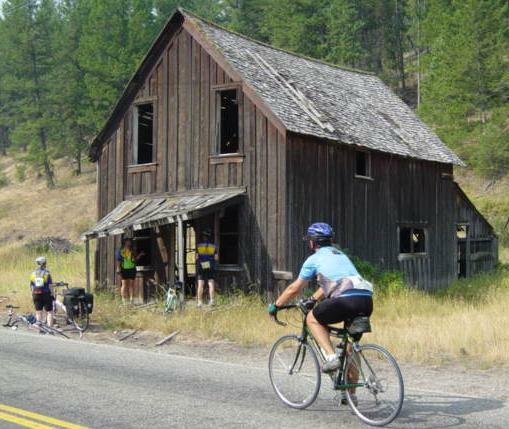 in the Northeastern U.S. and live a simple, frugal, life, and love being outdoors cycling, hiking, and walking. I left a job in 2014, and am looking at options currently ranging from possibly not working, to working part time in the business world. My living expenses are about $1,600 monthly or $20,000 annually, and I don’t have any debt. I am not sure at what age I will stop working; anywhere from now until 70 years old, I don’t plan on taking social security until 70 years old. This is a total of roughly $880,000. 1. Retirement. Obviously I need to put the Vanguard retirement money into action. I’m thinking about putting it into the Vanguard total stock market index fund, and the vanguard total bond market index fund, the allocation maybe at 70/30 between stocks and bonds, using admiral shares. I’ve read that you like putting it in as a lump sum rather than DCA (dollar cost averaging), but I’ve felt that we’re due for a correction, and, yes, I know that you don’t believe that one can successfully time the market. What would you do with the $190,000? 2. Can I afford to stop working now? Would you advise that? What should I do with the $410,000 in cash if I stop working? It seems that whether I stop working or start to work on my own now, I need revenue to pay my current monthly expenses, or I start drawing down on my savings. 3. What would you do with the $410,000 in cash if I go back to work and start earning money? Buy a home? Do nothing and stay liquid? Put it in the same Vanguard funds but in a taxable account (? )-seems like duplication. Make loans in lending club, betterment, etc.? Invest in T-bills, tax-free bonds, or a vanguard dividend paying stock fund? This probably would be short-term money, 0-5 years. 4. The $275,000 is investments in businesses with a close relative, I am nervous about being paid back, and this has caused me worry and stress. Any thoughts? 5. The property that I live in was sold recently, it is a 3 family built in the mid-1800’s, including an apt that I live in, and a large garage that can be rented out. I could have paid cash for it. I decided not to because of its age, I would not do the bigger repairs myself, and I was nervous about buying this before getting paid back on my business investments. If they went south I could be stressed financially, and I also wasn’t sure if I wanted to be a landlord. It is likely that it would have thrown off positive cash flow immediately. The fact that I passed on the acquisition has been bothering me, wondering about your opinion on this? 6. I live in what I call a “stupidly expensive” part of the country (the Northeast), due to the housing prices and cost of living. It doesn’t seem worth it, but maybe I’m just mad that I didn’t make a ton of money in the housing market!! I have some family here but other than that there really is nothing keeping me here. I’m considering looking at other parts of the country, where I can enjoy the outdoors more, either the mountains or the ocean. I’m tired of the “grey” winters and early darkness here, maybe I should go somewhere else for the winters, at least initially. I am considering Tucson, Albuquerque, Sedona, Santa Fe, Pueblo, Co., I have enjoyed not working, and spending days hiking and cycling in the desert southwest sounds appealing. 7. I like a simple life, and feel that there is value in that. I’ve read your opinion on renting vs. buying, but long term do you think I should look to purchase a home? Finally, I know that these are questions that are personal choices, and it isn’t even fair to ask for your input, but any opinions that you have would be greatly appreciated. Let me start by saying “thank you” for your kind words but, even more, for your clear understanding of the limits of my inputs and the personal responsibility you bear for any and all actions you take. I make this abundantly clear on my Disclaimers Page, but it is an important reminder. It is only when this is understood that I can offer any thoughts and advice to the best of my abilities and my understanding of any given situation. Since you’ve also done a great job of laying out your situation and questions, let’s just walk through them one at a time, but a little out of order: 1, 3, 4, 2, 5, 7 and 6. 1. If you want your investments to grow and keep pace with inflation, you have far too much held in cash. While most see cash as ultra-safe, the truth is that it is a guaranteed long-term loser. Each year inflation erodes its spending power a little more. Death by a thousand cuts, if you will. Stocks are, of course, far more volatile but they offer the growth needed to power a successful portfolio over the decades. In fact, the more stocks held in your portfolio, the more likely your investments will last. Bonds, in turn, diminish growth but we hold them to smooth out the volatility of stocks. So in determining your asset allocation a key question is how big a price are you prepared to pay for that v. how important is growth. You are also correct in that I am not a fan of Dollar Cost Averaging, nor can anyone time the market. Jack Bogle is fond of saying that in his 60+ year investing career not only has he never met anyone who can time the market, he’s never met anyone who has met anyone who can time the market. I certainly can’t, although each year I make predictions in my annual contest designed to mock the very idea. If you want my predictions for 2015, you’ll find them there. Just remember that any resemblance to my predictions and what actually happens is pure chance. This, by the way, is true of EVERY expert out there making such forecasts. No matter how credentialed they may be. That said, I would take $190,000 you have in Vanguard retirement accounts and the $410,000 in the taxable bank accounts and look at them as a whole for allocation purposes. Your proposed allocation of 70/30 stocks and bonds sounds reasonable to me and I like the idea of using VTSAX (Vanguard’s Total Stock Market Fund) and VBTLX (Vanguard’s Total Bond Market Fund) as the investments. But if you are very nervous about the market, you can increase your bond allocation. This is the better strategy than trying to time your entry into the market. Your allocation, not timing, is the right tool for mitigating risk. Finally, because it is less tax-efficient, hold your VBTLX in your tax-advantaged retirement account. That said, your allocation design comes first. This means it is OK to have some VTSAX in your tax-advantaged account or some VBTLX in your taxable account if required. 3. In this question you asked about investing your $410,000 but, as you can see, I’ve already deployed it in the VTSAX/VBTLX allocation above. You emphasize your desire for simplicity and I strongly second that. Those two funds are really all you need and, in owning them, you are very broadly invested in a diverse range of stocks and bonds. You really don’t need to concern yourself with lending clubs, Betterment, T-bills, tax-free bonds or sector funds such as dividend paying stock funds. 4. The $275,000 you have invested with your relative has me worried, too. If you are not comfortable with the situation you should seek to get cashed out, even if it means taking a loss. If you are unable or unwilling to do so, you need to make a clear, hard-nosed assessment of how much of that $275,000 is really secure. This is the number you should use in figuring your net worth and you should err on the conservative side. Since I have no idea about the situation or how to value it, for the purposes of the rest of this Case Study I’m going to subtract it from your $880,000 total and work with $605,000 as your net worth. 2. Using $605,000 and the 4% rule (which should work nicely with your 70/30 allocation) your portfolio can support ~$24,200 a year. Since your annual expenses are only $20,000, the great news is that you are fully FI and with a withdrawal rate of only 3.3%. Congratulations! Pulling the 4% is my post on how to go about doing this. Continuing to work is now entirely optional and the decision should be based on what gives you the most joy. As for Social Security, your plan to wait until 70 years old to take it is a good one, provided you are in excellent health. The break-even for delaying payment is ~82-86 years old. Die before that and you would have been better off taking it at 66. The longer you live past that, the better your decision to wait until age 70 becomes. Further, despite all the scary talk, Social Security is secure. It will be especially nice to have those larger checks as we become very old and our mental capacities diminish. Personally, I too plan to wait till I’m 70. Actually, I will be surprised to live to be 82, but my wife is very likely to live well into her 90s and she’ll benefit from my larger checks. And, of course, I might get lucky! 5. I think you dodged a bullet in not buying the three-family house. Investing in real estate can be profitable, but it is also a part-time job and a very specialized one at that. It is not something to be done on a whim or without extensive research. If you are going to be a landlord, you had best become an expert in land-lording. Plus a building that old is likely to need an ongoing range of maintenance and repairs. I don’t read any desire for or interest in any of this in your note. Here’s a cautionary tale, appropriately titled The Rental from Hell, written by a guy who also backed into it as you almost did. And, if you’re curious, here’s Part I of my own nightmare after doing the same. If you want to invest in real estate, there will always be properties to buy. But first, spend the time needed to educate yourself as to what’s involved. Only then can you make a sound decision and a profitable investment. 7. If you like the simple life, I certainly wouldn’t buy a home. Especially given that you are uncertain as to where you want to live. Renting is likely to be cheaper, more flexible and more likely to permit you to continue living on $20,000 per year as you currently are. 6. Where to live. Like you, we live in the Northeast but here in New Hampshire things are slightly less “stupidly expensive” than in many other parts. While we’ve loved it here, sometime in the next couple of years we might very well move. We’ve been here awhile and we like change. 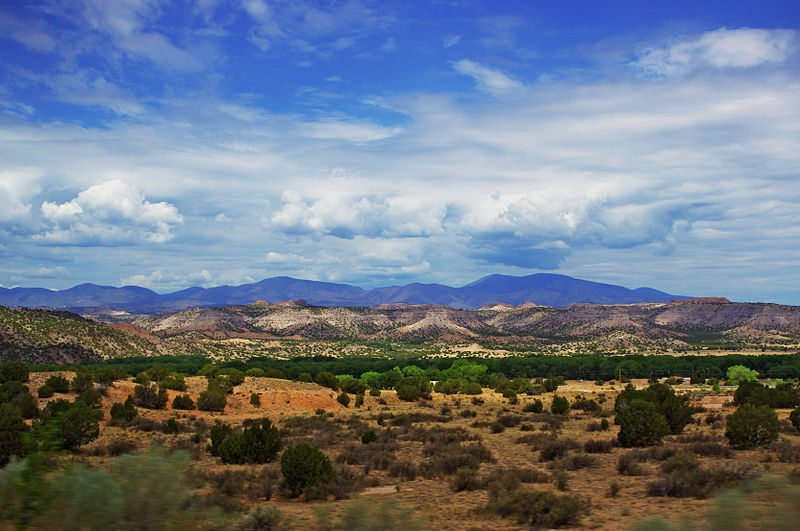 And, like you, we are closely considering the Southwest, specifically New Mexico. We’ve traveled there many times and have friends in the state. We find it stunningly beautiful and the endless visas are amazing. While NH is equally beautiful, the type of beauty is entirely different and, as I say, change is one of our motivations. We also prefer a dry climate. That said, we do know people who have moved there from the more lush and verdant areas east of the Mississippi and who grew to hate the relentless browns, dust and lack of water. Will that be us? Who knows? But one of the beauties of renting is that it is easy to move on. Another reason to be slow to buy a house. My pal Darrow recently made the move out there and he and his wife are thriving. You might be interested in his story on finding The Ideal Retirement Location. You also mentioned liking the ocean and, of course, living on the water in the US is very expensive. But if you are willing to look to Latin America, all kinds of ocean side living options open up. 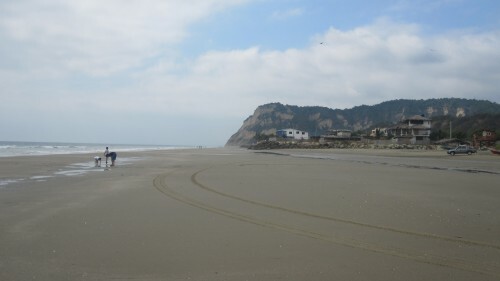 I’m personally partial to Ecuador and I’ve enjoyed the time I’ve spent in the little fishing village of San Clemente. But there are many others. Once you are no longer tied to a job, the world opens up and the limits are only your imagination. You are in a great position to create the rest of your life as you see fit. Good luck, keep us posted and maybe I’ll see you out there! *Just this week I was interviewed on Why your house is a terrible investment with Mike & Lauren YouTube. In the Q&A we also discuss asset allocation, bonds and even dating. 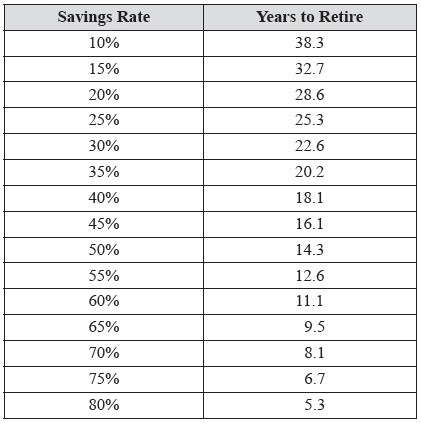 **If reaching financial independence is important to you, the chart below will give you a good idea as to just how powerful your savings rate can be. This is a total guess, but given the amount of cash John is holding, I would imagine another concern of his might be the draw-down process once he invests in all these stocks and bonds. John, if this is the case, I am no expert on this topic, but I would recommend reading as much as possible on it to get comfortable with your strategy. For instance, given your past actions, you may only be comfortable if you leave 1-2 year of living expenses in cash. That’s ok if that’s what gives you peace of mind. When the market is up, don’t touch the cash or the bonds, draw down from the stocks. If the market crashes, use the cash. If you run out of cash, or you are just in a market correction, use the bonds. Drawdown strategy can be daunting, so I would highly recommend crafting a strategy that you are comfortable with first. Thank you for your input and suggestions, I’m looking at a strategy currently that I can be comfortable with. It’s really great seeing all of these case studies that are ready to retire but are worried about it. I always think of it as a “it’s easier to see it from this side” since it’s not actually my money/situation. I’m sure, when you’re in the thick of it, it’s a lot harder. On top of all this, I also find the family investment troublesome. Who knows whether or not it’s actually paying out and whether the person can just drop ~300k like that. I don’t plan on investing in anyone’s business like that, especially if they’re friends/families. “and they don’t keep you up at night. I know everyone seems to be so caught up in the losing position of Cash due to inflation. But I think there is something to be said to having a significant portion of cash lying around for extraordinary opportunities. As you said, and I tend to agree, no one can time the market. However you can be patient and wait for really great opportunities. Lets face it, the markets and therefore asset prices are cyclical. And because of greed and fear we are always going to get prices that go too high and that correct too low. The bottom of the financial crisis was a great opportunity to put money to work in almost any asset. But if you were fully invested at the 2007 highs you would have had to wait 5-6 years just to get back to previous highs. Now I would ask how productive your investments were vs. cash? Wast that 1-2% inflation really that big of a deal after such a huge haircut? One of my investment rules is to buy into weakness. October of 2014 was a perfect example of this. Any time you can reduce your cost basis you increase your probability of profit in an asset. By buying into weakness you actually give yourself a better than 50% chance of making money. Because as you stated no one can predict when the markets will go up or down, its a 50/50 probability. Regarding buying bonds. This is also another thing that is hard for me to recommend to people. Bonds are at all time lows with interest rates at all time highs. The risk/reward favors the downside due to the inverse relationship of bond prices and interest rates. The fed is essentially already at zero, how much further can interest rates go down? My bet is not much. A 1% move up in interest rates would result in a huge loss of capital of 17.4% (https://www.tastytrade.com/tt/shows/what-else-ya-got/episodes/bonds-and-convexity-01-28-2015?locale=en-US). With 30-year bonds at 3%, you are looking at almost 6 years of interest gone. What if something comes up and you need the money??? Jut my two cents. Enjoyed reading the case study. I afraid I have to disagree with you absolutely here. Yes, markets are cyclical but knowing this provides an advantage only if you also know when the cycle will turn. Nobody does. It is easy to look back and convince ourselves that we do. Too often I hear folks lament that they missed the wonderful buying opportunity of 2009 when the market bottomed around 700. 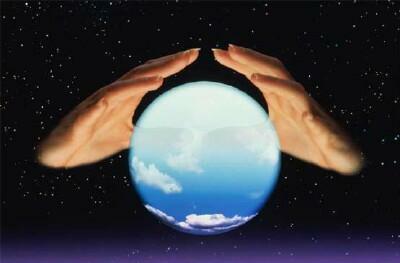 But at the time, most predictions were that it was on its way to 200. To buy in at 700 would have meant risking a 2/3rds cut. Of course, we know now that didn’t happen. But anyone who says they knew it then is lying. At the time, the market was trading ~1670 and many, like you are now, were suggesting holding cash for a better entry point. Those who did so missed a 21%/347 point rise to today’s 2017 level. It would take a 17% drop from here for them to have the opportunity to buy in at that level again, let alone one better. Of course, when I wrote that article I had no idea what the market would do. And that’s the point. You suggest buying into weakness as a strategy. But what does that mean? If the market drops from here to 2000 do you buy? 1950? 1900? Or, if it rises to 2100 and then pulls back to 2050? You say October 2014 was a perfect example. Sure, if you knew at that moment it would drop ~9% and then bounce back from there as it did. Nobody knew this at the time. The drop could have stopped at 5% or continued down to -50%. Hindsight is always perfect, but it is an extraordinarily dangerous guide to the future. Further, since the markets rise far more often (about 78% of the time, year over year) than they fall, your odds are not 50/50. They are stacked against you. As for bonds, you have conflated the Fed rate with the overall bond market. Predicting bond interest rates is perhaps even more of a loser’s game than predicting the stock market. Certainly rates are at historic lows. They were this time last year, too. Buying them then would have been a major win. He sees the long bond falling to 2% this year for a 19% total return and 27% on the 30-year zeros. Is he right? Beats me. That’s market timing. That’s also why I recommend VBTLX, the total bond index fund. If he’s right, the fund will see the benefit. If you’re right and interest rates rise, the fact the funds holds bonds of all maturities will mitigate that risk. Further, it is important to understand why I suggest holding them. They are there to smooth the ride. Not as a bet on the direction of interest rates. In the end, either you believe the market can be timed or that it cannot. The overwhelming evidence is that it cannot. This is one of the central messages of this blog. Jack Bogle is fond of saying that in his 60+ year investing career not only has he never met anyone who can time the market, he’s never met anyone who has met anyone who can time the market. Sorry if I was not clear, I was not saying that I would keep everything in cash. And I agree that hindsight is always 20/20. I just personally think you should keep cash available for opportunities that arise from price corrections. You are absolutely right that no one knew where the bottom or the top of the market would be. And my example of October 2014, was just to point to an example of a time when the market traded lower and you could have bought into weakness. I never said it was a guaranteed winner, because as you point out it could have kept falling after you made your investments. Also no one knew that the market would pop back up 14% in just a few short weeks to make new all time highs. I guess buying into weakness has worked out pretty well for me and is one of the investment rules I follow. It is open for interpretation. But I am typically looking for 5-10% corrections in price before I commit new capital. And because I don’t know how low a price can correct I tend to ladder in (or dollar cost average). I guess we will have to agree to disagree. In my experience the best thing about investing and trading is that two people can have completely different philosophy’s and both can be profitable. One way I can think of both goals of ‘keeping cash for opportunities’ and ‘investing regardless of what the market does because you can’t time it’ being compatible is if you consider cash as part of your asset allocation. Rebalancing on a monthly basis, or until a 5+% variation impacts your allocation, could have triggered an adjustment in Oct 2014. As for a little thought on whether or not the low-yield bonds make any sense, I think looking at how Japan’s bonds yield has been below 2% for almost 2 decades and comparing to the Nikkei that is still 10% below its level from 20 years ago, in hindsight, the bond yields were attractive. Note also that Switzerland has just started to issue negative yield bonds and investors are now *paying* to keep their money safe. The US Treasuries at 1.8% ‘risk-free’ actually look like a great opportunity. Always love to read your posts Jim and congratulations GYFG for starting the Yakezie challenge! Great post jlcollinsnh! If John wants to live the simple life, I too agree buying a house is not for him. And New Hampshire is a great place for him to enjoy his hobbies of cycling, hiking, and walking. Also I can only imagine what his accounts would be worth today if he had put them to work years ago, but as always hindsight is 20/20. But definitely getting that money into some cheap index funds is a must!! I don’t think he is in NH, but you’re right it is a great place to be. As for me, I stupidly resisted the idea of indexing for 20+ years. If only I hadn’t been so stubborn, my net worth would be 2 or 3x what it is today…. Actually, the reason I didn’t was that I was growing a small business and wanted to be as liquid as possible to finance expansion. Great case study, Jim. Some good insights into and reminders for financial planning, especially around buy versus rent. I highly recommend the southwest—I relocated from Pennsylvania a few years ago and really enjoy it. Consider Arizona among your options as well. I will not be buying, renting is the way to go. I’m interested in Phoenix, Tucson, Alb., Santa Fe. I don’t plan on working as of now, and I’d be interested in your opinions on the specific towns in these areas. My particular interests are cycling, hiking, walking, etc., and I’d prefer to live near the center of town as opposed to out of town. Thoughts? I actually share the same outdoor hobbies. In the Phoenix area I’d recommend looking into Ahwatukee Foothills and North Scottsdale for great hiking and cycling. I’m looking forward to getting to the desert Southwest to check things out, it’s currently 14 degrees where I am! I cannot thank you enough. I’ve been reading your blog quite a bit, and I’ve read a lot about investing over the years, and your blog is the best information that I’ve ever read on investing, business and life. It is an incredible education. I hope that you realize what you’re doing for people, I’m sure that you have many talents, and it seems to me that this is one thing that you were born to do! My thanks also to the folks who have commented. I have a few questions, it might help you to know that the $190,000 with Vanguard consists roughly of $141000 -traditional IRA, $6500-Roth IRA,$38000-Simple IRA and $6000 -individual stocks. Of course I understand that I’m responsible for any and all activity. 1. You are recommending putting $605, 000 into stocks and bonds? What about cash? Did I read in your blogs that you and your wife keep about 3 years of expenses in cash? I was considering keeping $50,000 in cash, reducing the total to invest to $555,000. Or are you assuming that if I need cash I increase the amount drawn from my taxable account? 3. I’m not clear on the allocation and execution. You mentioned putting more bonds in my IRA, what allocation vs my taxable account? Am I to look at both of these together for allocation purposes, and as I withdraw more as time goes on I start with the taxable? If I take living expenses from the taxable, is it coming from dividends and capital gains that I’ve directed them to send to me? 4. In regard to the withdrawals (3-4%) from the taxable account to live on, do I just have that sent to my bank checking account? Monthly or quarterly? I should confess that I have a little buffer in my annual expenses that I submitted to you. 5. Finally, you were comfortable with a 70/30 stock/bond split. Is this aggressive for a 57 year old, in our current market environment? ..and thank you for the very kind words. 1. We hold almost no cash these days. When my wife, who handles all our daily spending sees the checking account getting low she logs onto Vanguard and transfers what she needs to our checking account directly from our joint, taxable VTSAX account. Last time I checked we had about $11,000 in the checking account. I called it The Wealth Building with Cash Insurance Portfolio, but I couldn’t make it work to my satisfaction and we’ve never used it. But you should hold cash in the amount that makes you comfortable. But $50,000 for a guy who is FI and only spending $20,000 per year seems high to me. Again, cash is “dead” money. As I said in my reply to GYFG above, at the time the market was trading ~1670 and many then, like now, were suggesting holding cash for a better entry point. Those who did missed a 21%/347 point rise to today’s 2017 level. It would take a 17% drop from here for them to have the opportunity to buy in at that level again, let alone one better. You are hoping and wishing for the ability to time the market. Nobody can. I have no idea what it will do in the short term. As I said, the way to mitigate the volatility of stocks is with your allocation in bonds. 3. When figuring your allocation you want to consider both taxable and tax-advataged accounts as a whole. Then, since bonds pay interest and are tax-inefficient, to the extent possible you want to hold these in your tax-advantaged accounts. This means that your taxable accounts will hold your stocks. As you draw down on these, and as the market fluctuates, you will want to rebalance. Once a year is usually plenty. You can have them send you the dividends and capital gains distributions directly, but you will also be selling some shares along the way. 5. 70/30 would be considered by most to be very aggressive for a 57-year-old. I think the standard rule of thumb is something like your bond allocation should equal your age. But that’s me. Given your concerns, you might want to consider it. In reviewing your questions and my answers, I suggest you give the entire Stock Series another careful read. It is going to be very important that you stay the course once you put any plan into action. When the market does plunge, as someday it surely will, this will be very difficult if you don’t fully understand the whys behind all this. Thanks for sharing a link to our real estate horror story Jim! I’ve been called “emotionless” more than once by friends and family. But even I would have a hard time investing $410k cash without some sort of dollar cost averaging. Your suggestion of a higher bond allocation is a great alternative. This got me thinking about my own emotional-threshold for a single purchase. I think $100k is my limit. That’s the point where fear would start casting a shadow on math and logic. That’s a great point, Mike. Sometimes I don’t allow enough slack for the emotional side of these decisions. I just saw you on Youtube with “Mike and Lauren” discussing the buy vs. rent argument regarding housing. I noticed that it also helps to see the people and hear what they have to say when trying to understand investments, in addition to seeing it in writing in a blog. I’d love to see a youtube video on what I’m working on now-an investment strategy and execution plan that takes into account asset allocation, drawdown methods, tax implications of withdrawals, Roth conversions, and RMD’s upon retirement. I know that’s a lot, but maybe each can be addressed individually on separate videos and then summarized in another video at the end. Just a thought, maybe there are other folks out there who would be interested as well. It would just be another way to teach people. Seriously though, we can’t wait to have you on again. I’m not sure yet what that “threshold”number for a single purchase will be for me. I really enjoyed your interview with Jim on Youtube (Mike and Lauren) evaluating rent vs own, and one thing is for sure-I will not be investing that cash in a home in the near future. I guess I like having “wings”! Very nice case study Jim and answers. I must admin that I learn something new every time I go through new posts and comment section on your site. Thank you very much for the advice you provide to all of us. I just have one question on the allocation of assets within taxable accounts and non taxable accounts. Specifically on Bond funds. I didn’t get your advice on holding bonds in tax advantage accounts (i.e. 401K, IRA, etc). Shouldn’t it be other way around? You should try to hold bonds in taxable accounts rather than non taxable accounts. My logic behind this is, when you are in need of money you can sell the bond funds first from the taxable account and let the stock fund VTSAX run it in retirement account without disturbing it. We are young family in our early 30’s and our target allocation would be 80/20. We just started our wealth accumulation phase last year. I even don’t mind putting all the bond in stock when we hit the down turn like 2008. I see bonds has two fold purpose – 1) to smooth the investment ride and 2) a very good substitute for holding cash in savings accounts. You can swap out bond funds for stock if you feel market is going through big correction. Not timing the market but if we hit the major correction and if you have a investment horizon beyond 5 years may be you can reduce your allocation to 90/10 and take advantage of weakness of stock. On the other hand stock are more a vehicle for accelerating your wealth and hence it is always better to put it in tax advantage account. Say if you are investing 5K in bond then it is better to hold it on non taxable account from your net income as you already paid the tax on it. But on the other hand if your all before tax investment directly goes to buying VTSAX you have more money working for you. Am I missing something here? Would you or anyone else clarify why it is best to hold bond in tax advantage account than taxable account? Because bonds (other than munis) pay taxable interest they are considered tax inefficient. Holding them in tax sheltered accounts protects this interest from taxes. That said, there are certainly advantages to holding stocks in tax advantaged accounts as well. In a sense, it would be ideal to have everything tax sheltered. On another issue, you want to be careful about seeing bonds as a cash substitute. Cash in a savings account is largely free of risk to capital. These days its spending power will be slowly eroded by inflation, but the capital stays the same. I hope you’re well, if you went to Chautaqua in Ecuador I applaud you for your “weather timing”, you got out while the Northeast was getting bombarded with snow! Are you still sure that you can’t time the stock market like you did the weather? Your combination of life experiences, intelligence, and compassion resonates throughout the entire blog, I’m sure you’d like to earn a little profit but it is obvious that you really want to help people. After reading more of the blog I’m even more honored and humbled that you chose my situation as a case study. 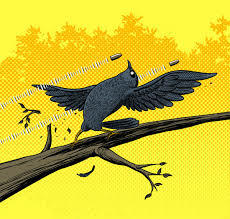 Additionally, I spoke to Vanguard and Fidelity, and I’ve decided to implement the strategy that you recommended to me. The only difference is that I think I will use a 60/40 allocation initially, which reflects my caution on the stock market currently. I may increase that to 70/30 later. I will invest in a lump sum, using VTSAX and VBTLX, nice and simple. In regard to travel, you made a great point when you suggested countries to the south of the US as places to enjoy the ocean relatively inexpensively, giving San Clemente, Ecuador as an example. I’d like to explore this more, with my priorities being the ocean, low cost of living, and safety. If you have any additional suggestions on any topics I’d love to hear them, and I’d love to hear comments and suggestions from your readers as well. Thanks for checking back in with a follow-up. It’s good to hear your plans. For the last two years, I’ve had the entirety of my money in the total market index fund. Obviously the returns have been great and I have a deep belief in indexing. One thing that gave me pause, and something I want to ask you, is that the only thing that makes me think is the consumer staples sector. It has consistently outperformed the market and has had much less volatility than the total stock market. I think I already know your answer, which would be that it is easy to look at historical performance and pick winners and losers (think healthcare vs technology). Fundamentally, stocks outperform bonds and cash in the long. We know that from looking at historical performance. Could consumer staples be fundamentally structured to outperform the total market, or could there be a huge bear market for the consumer staples industry? Just thoughts of mine. I think investing in the total market is a cash generating machine long term and will reach my goals while I feel confident that every dollar I put into the index funds is backed by the hardworking american business, while consumer staples is a much smaller slice, and fundamentally even less diversified. I was just curious of your thoughts. Understanding that, if you want to hold consumer staples its not the end of the world. But there is nothing in them fundamentally structured to outperform the total market. Such a thing is not possible. If there were, the market would flood the space negating the effect.